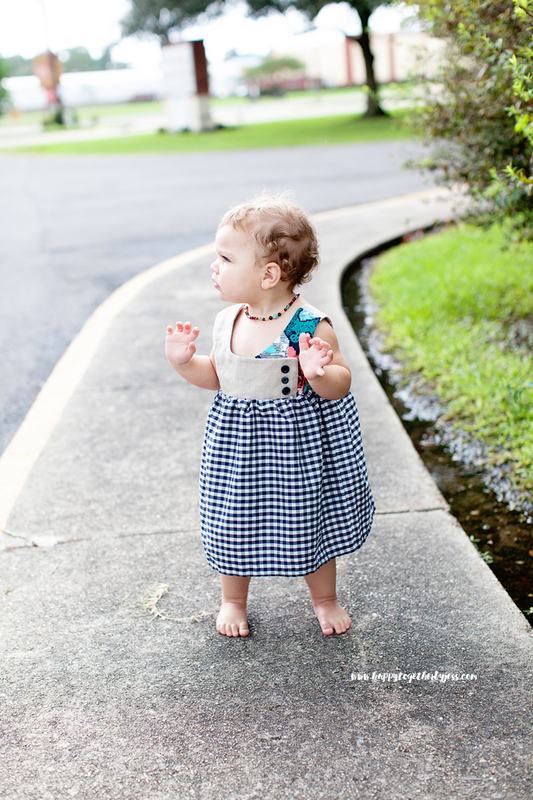 Quite a few years ago, I sewed up a cute little dress for miss E to wear at her first birthday (see here). 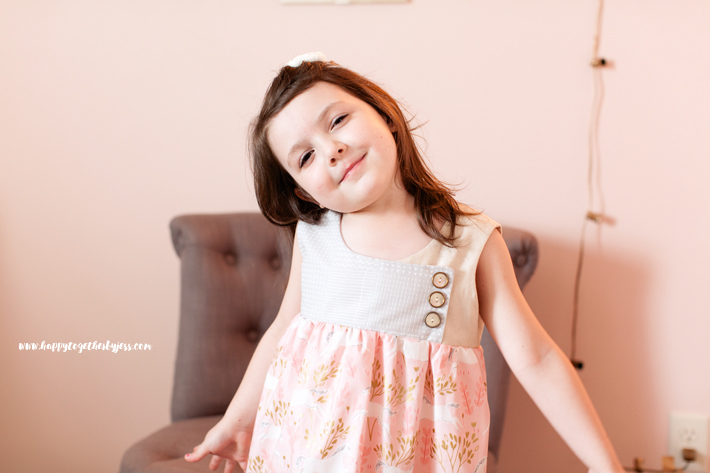 It has been in my head ever since then to create an actual pattern for it so I could sew more for my girls and share with you all. 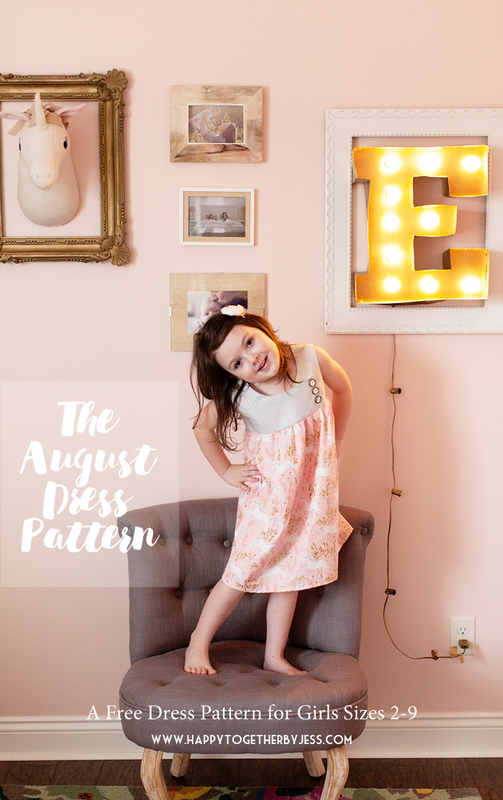 I had fun creating The August Dress pattern, named after miss E’s birth month, and I find it to be simple and cute. I really like how there is no need for button holes, zippers, or other closures since the hand sewn buttons hold the front in place but are far over enough that there is plenty of room to get it on in the neck area. I, of course, experimented with all the sizes. I did not do a ton of testing as this is a freebie pattern, so you may find you want to tweek some things. Miss J is wearing the size 8/9 in the above photo. 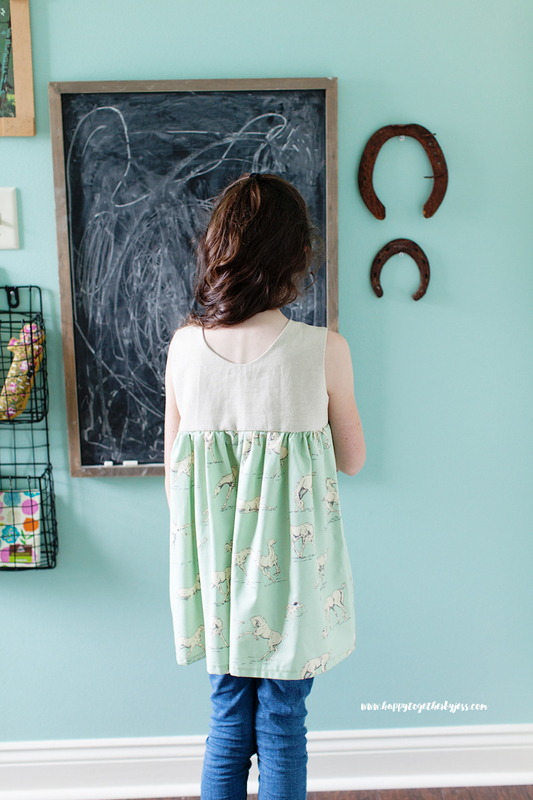 I didn’t have enough of the horse fabric to make a dress, so hers is shorter for a shirt option. 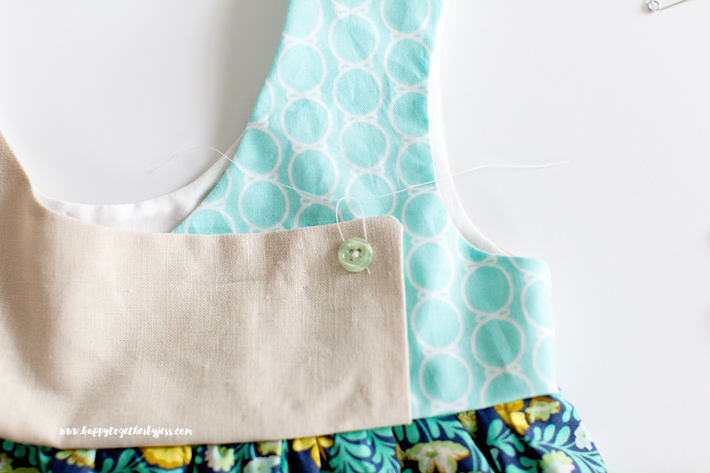 *Always back stitch at beginning and end of sewing unless otherwise stated. 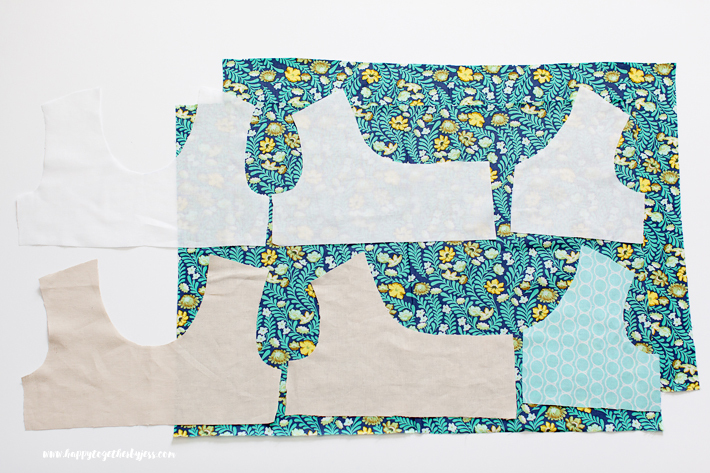 Once you have printed out the pattern, lay it down in order to see where to connect the pieces. It goes in order starting at page one at top left and going across and finishes with page 9 at the bottom right. Then cut out and tape together. 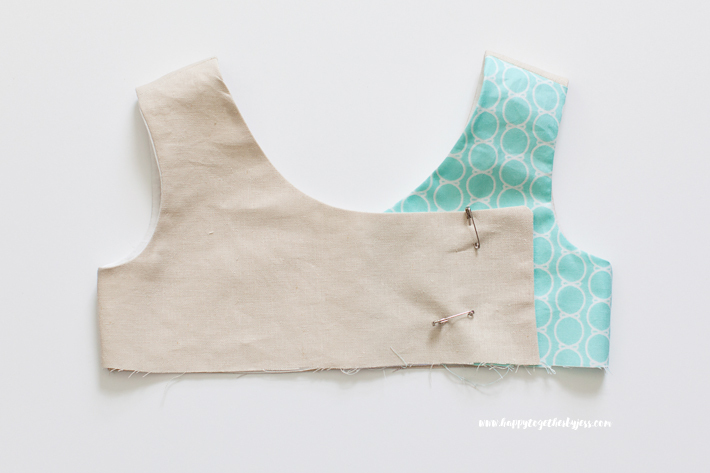 Start by sewing the top outer pieces first. Place the back piece down right side facing up. Take the front left piece and match up on the shoulders, right sides facing. 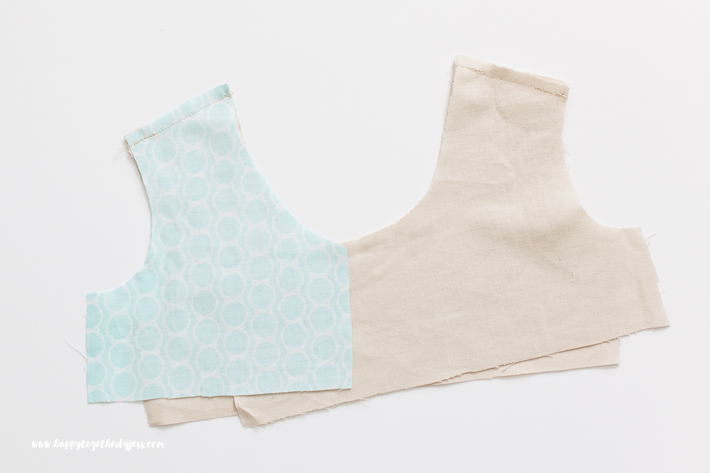 Sew together at shoulder. Take the outer front right piece and line up on the other side, right sides facing. 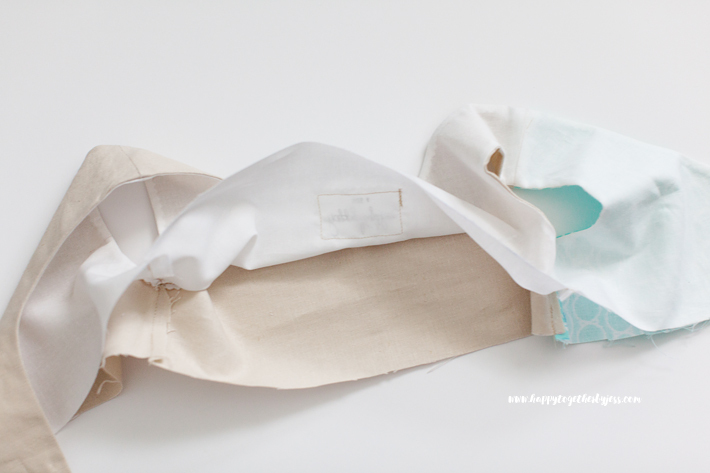 Sew together at the shoulder. Iron open the seams. Next, sew the lining together. This will be similar to the outer, but the sides are sewn on opposite. Place the back lining piece down, right side facing up. 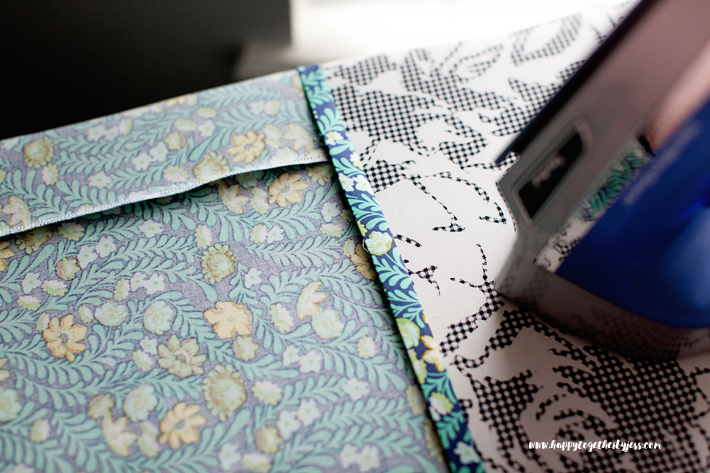 Then take the lining right side and match up at the shoulder, right sides facing. Sew together. 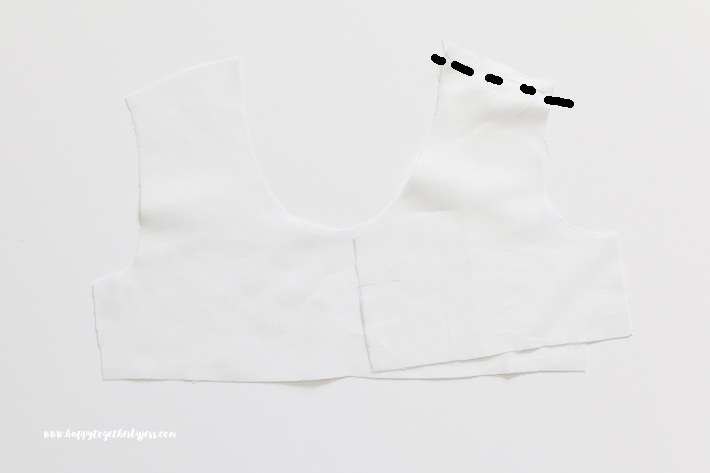 Take the lining left side and match up the shoulder to the back piece, right sides facing. Sew together. Open the seams and iron flat. The the outer top down, right side facing up. Place the lining on top, wrong side facing up. 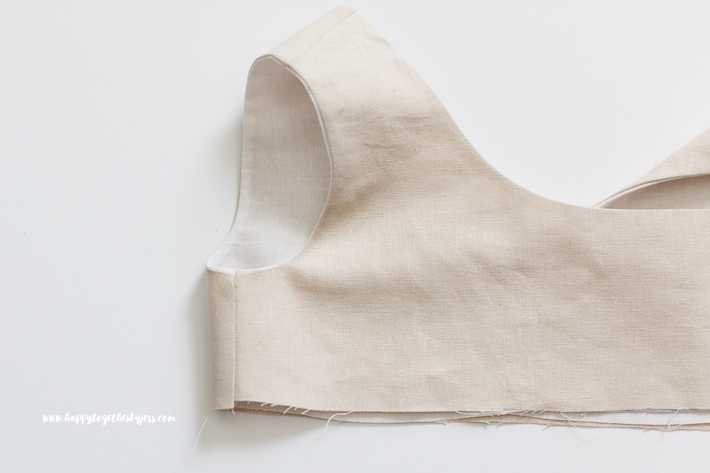 Match the shoulder seams and edges together. Pin in place. 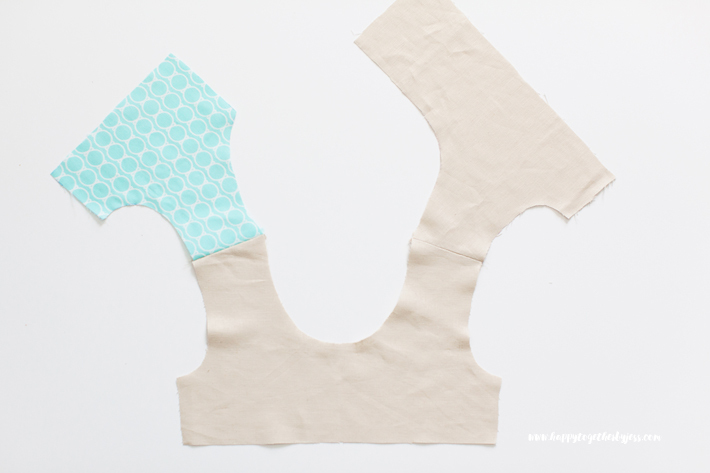 Sew together on each arm hole and around the front sides and neck. 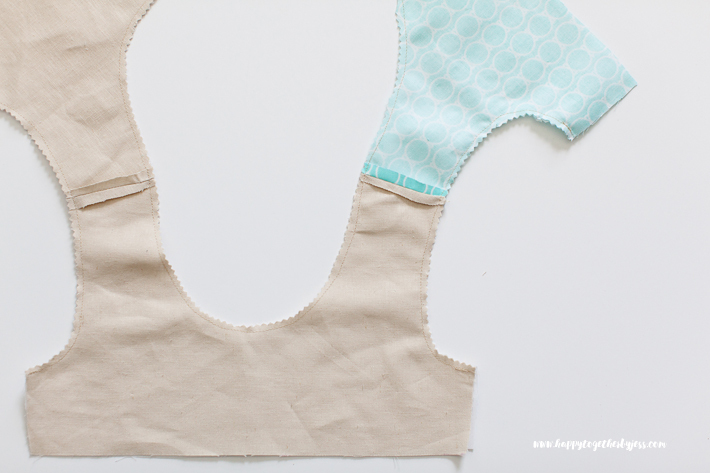 Once sewn, you will want to make notches on the curved seams so it lays flat once turned right side out. 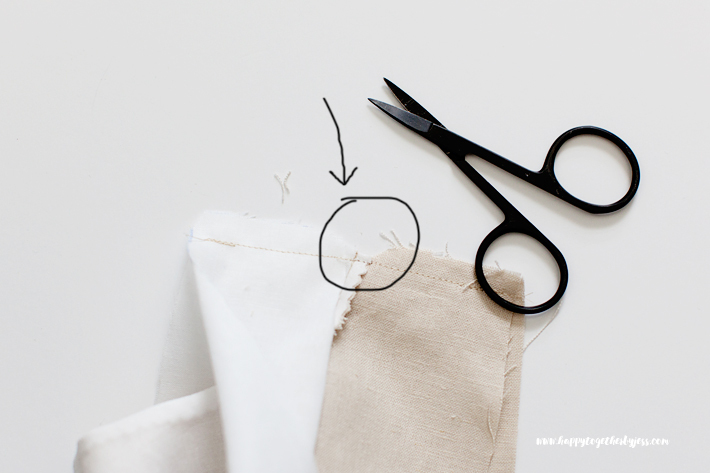 I simply use my pinking shears (scissors with zig zag cutting sides) and trim all the edges close to the seam. This eases the fabric on all the curves. Another little thing to do is clip the edges on the top sides of the front pieces. It takes away some of the bulk from this area for when turned right side out. Turn right side out and iron flat. *Tip: I use the eraser end of a pencil to push all the seams out for a cleaner finish. Now it’s time to sew the sides together. 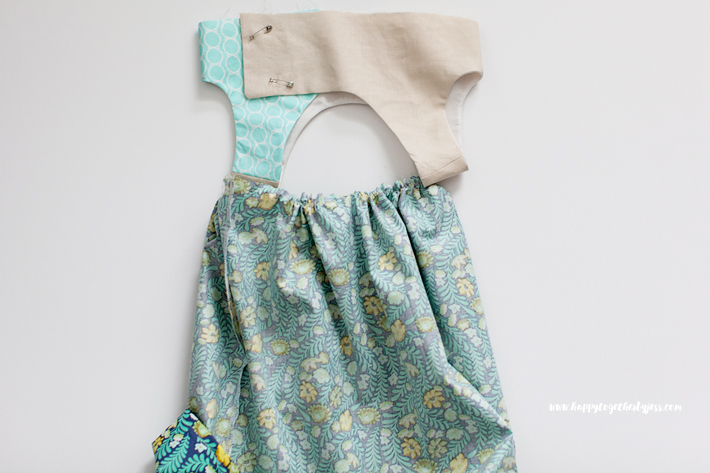 Open the side seams of the left back side and left front side. Match up at the seams, right sides together, and pin in place. Sew together. Again, it helps to cut a little notch at that middle seam to reduce the fabric bulk at that point. Turn right side out and iron. Repeat these steps for the right sides as well. 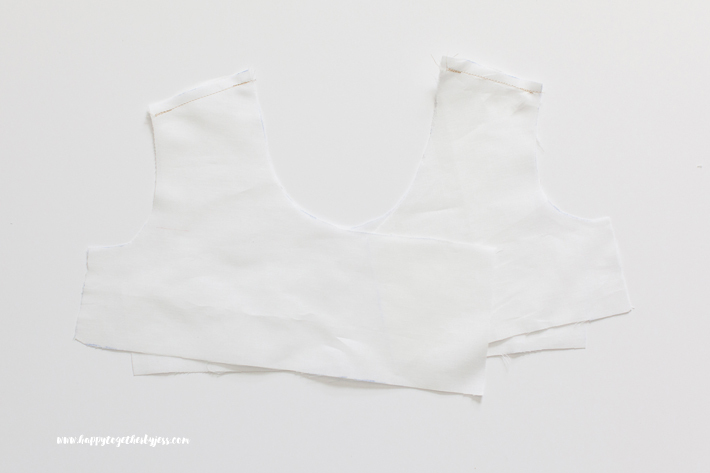 Place the top down and fold over the front pieces so the side seams are on the sides and the longer side goes over the shorter side. 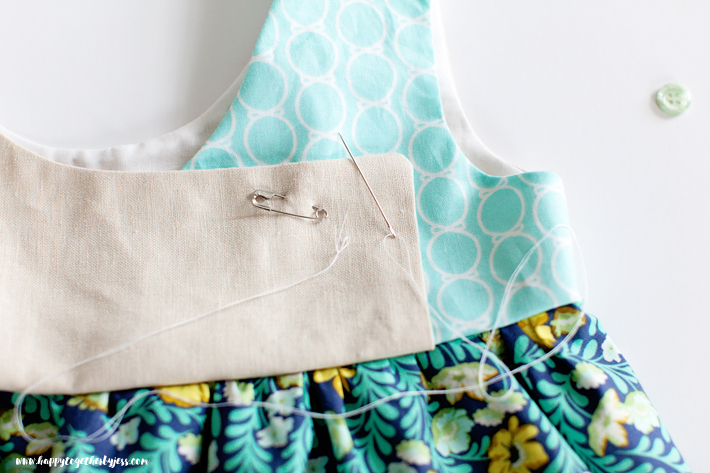 Use a safety pin to keep the front pieces together. Sew the bottom skirt next. Place the two bottom pieces right sides together. 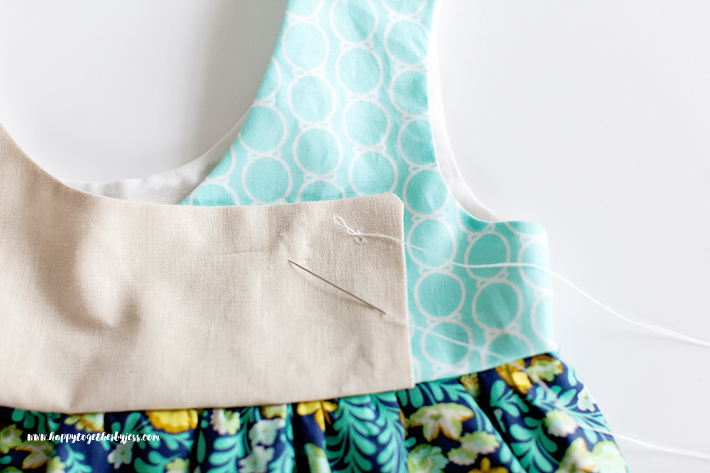 Sew together down the shorter sides. 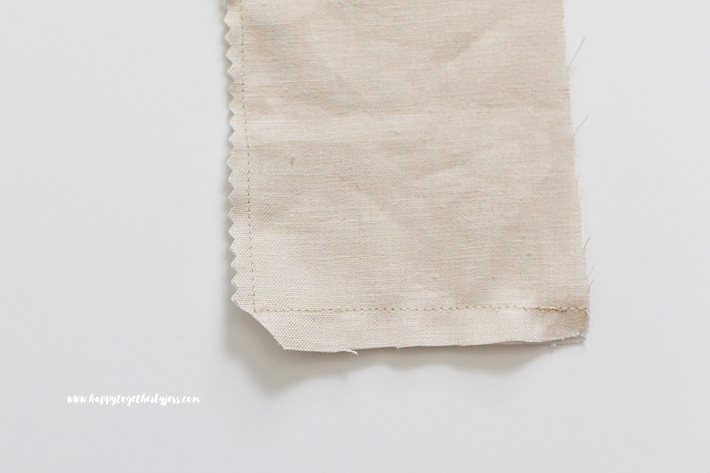 To have a cleaner edge, you can go over it with a zig zag stitch or use a serger. Iron the side seams and then iron the bottom up about 1/4″. 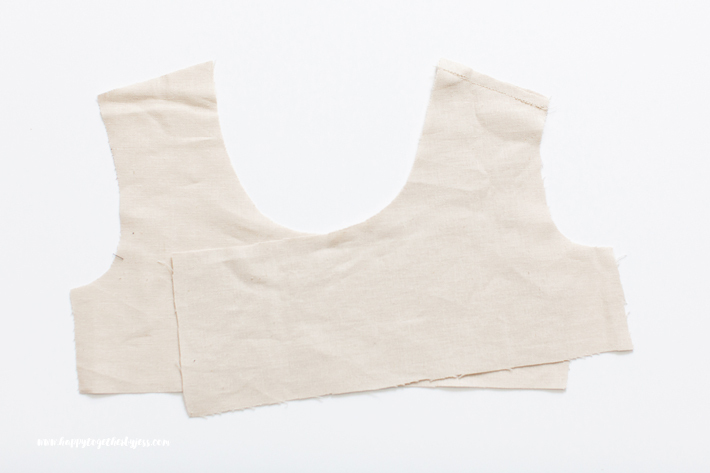 Fold up the bottom about another 1/4″ again and iron. 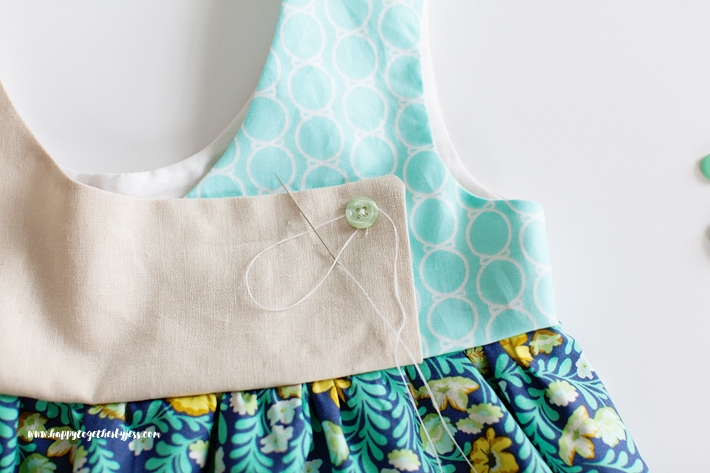 Sew around the edge. 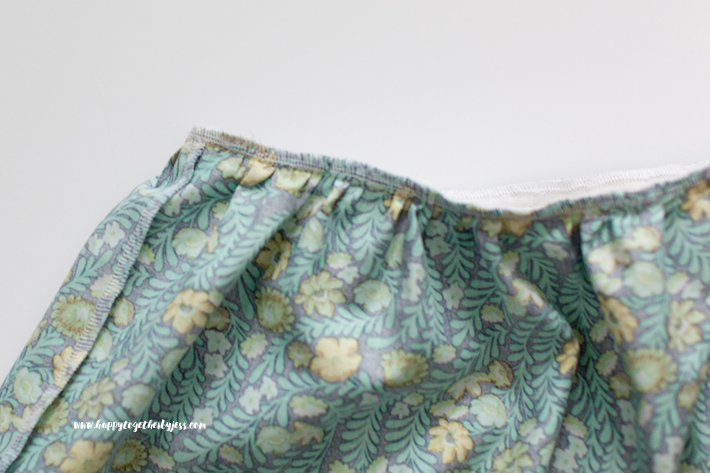 Now sew a wide stitch around the top of the skirt leaving a long tail at the beginning and end. This means no back stitching at this part. (My machine goes up to a 5 so I use that size stitch). I usually do a line from one seam to another then start another one on the other side. This helps make it easier to ruffle. 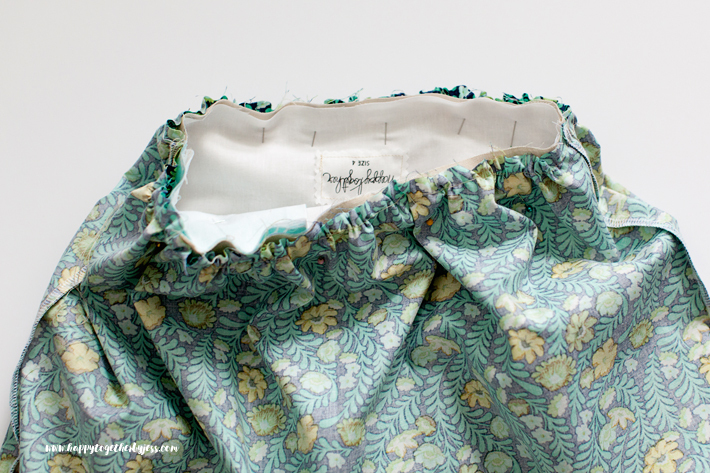 Pull on the back threads to ruffle each side until it is the same width as the top piece. Make sure the bottom is wrong side out and the top is right side out. 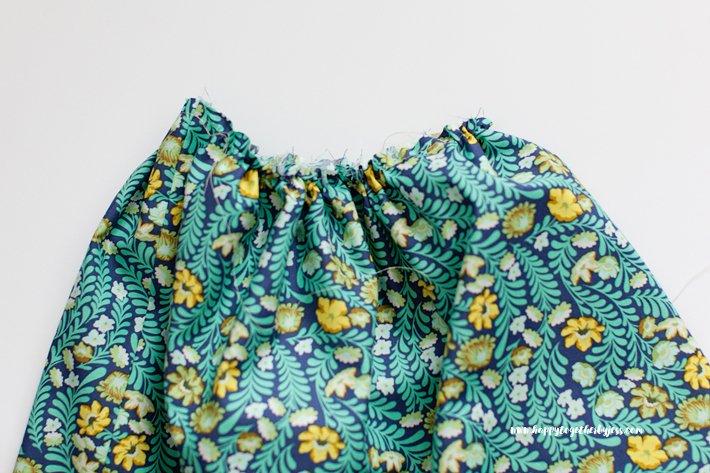 Place the skirt over the top and match up skirt side seams to the top side seams. Spread out the gathers so they are evened out around and pin in place. Then sew together. 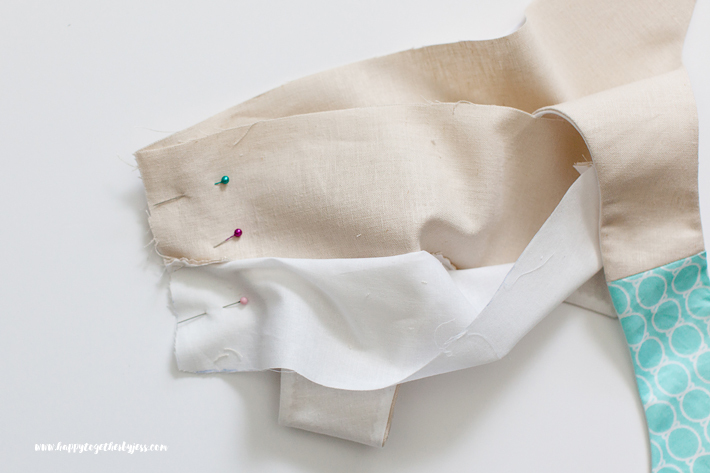 Finish off the raw edge with a zig zag stitch or a serger. Turn right side out and prepare to sew buttons in place. For the buttons, be creative! Use different colors, different sizes, same colors, same sizes…. have fun 🙂 Depending on the size will depend on how many you want to add. 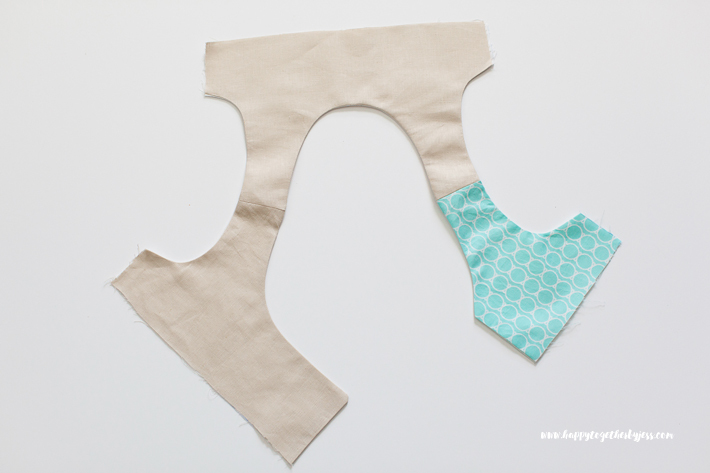 You can sew them on as you like, but I want to share real quick how I sew them on. I don’t want them falling off, especially when it’s for a younger child, so I really go overboard with this part. I start by threading the needle and knotting the two ends together. I pull the needle through the two front pieces at where I want the first button. Then I pull it back through and make a knot again on the end knot that is on the top. 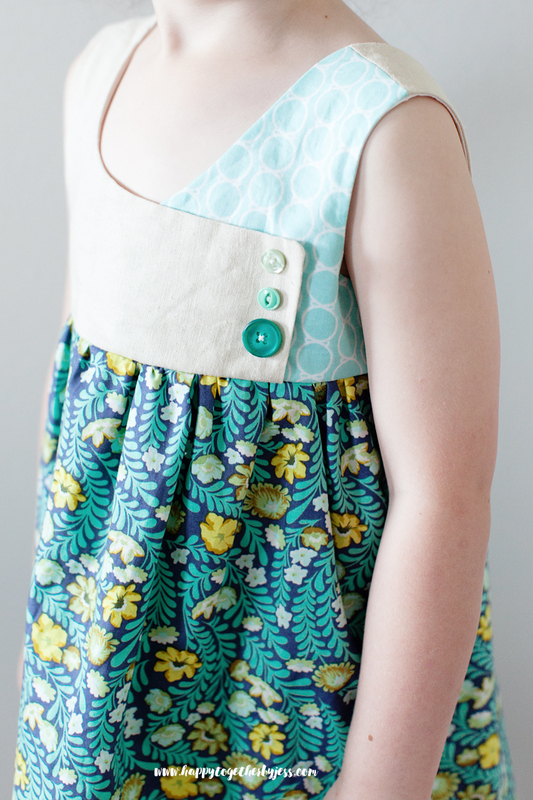 Then I sew the button on by going through the holes and the front fabrics a bunch of times to make sure it’s strong. Then I pull the thread through from the bottom and make a knot around the button (like above) a ton of times for extra strength. Next, I cut the thread and make a few knots this way with the two ends. Then I trim the extra thread off. I sew the rest on the same way. 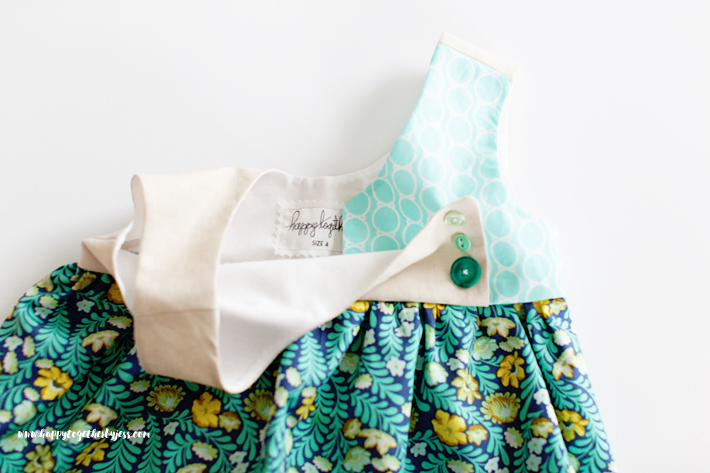 The buttons keep the top together but allows for room to have it fit over the child’s head when placing it on. 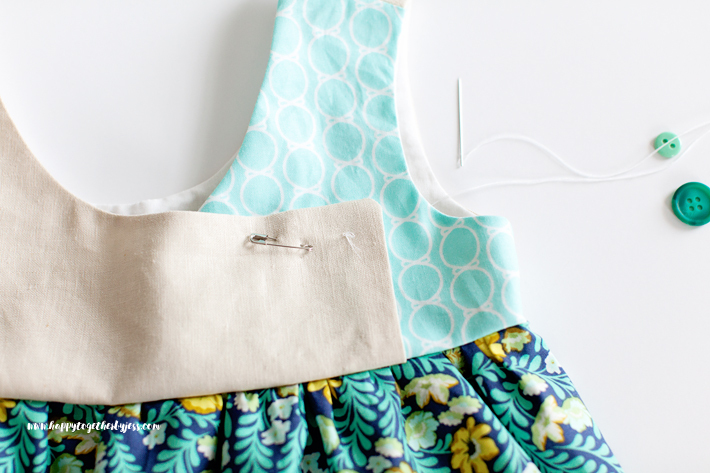 It’s a nice way to create a dress or top with no button holes, zippers, or other sort of closures. Nice, huh? She is wearing the 4/5 here. I love it! Thanks for creating and sharing the pattern! Love this, will be on my list to make next. 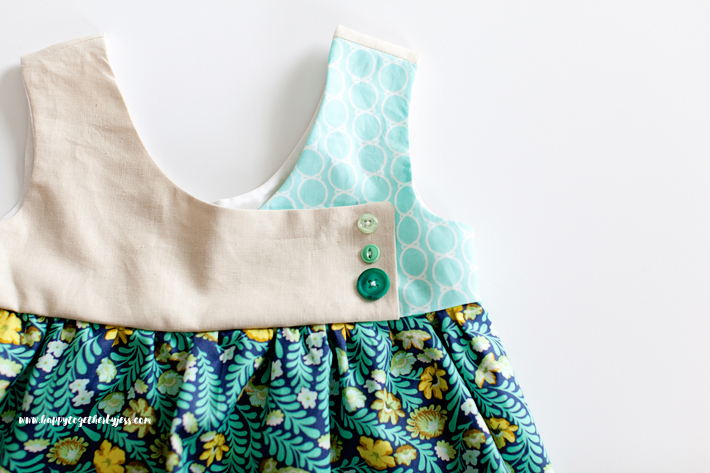 Also love the button-sewing tips, mine always seem to come off. Thanks a bunch! Thank you for this pattern! It is adorable! This look so adorable! I’m sure a great deal of time and work went into creating this pattern. It is so incredibly generous of you to share it with all of us — thank you! Will be sure to tag you in photos of creations! Thanks again! Thank you so much for your kindness! 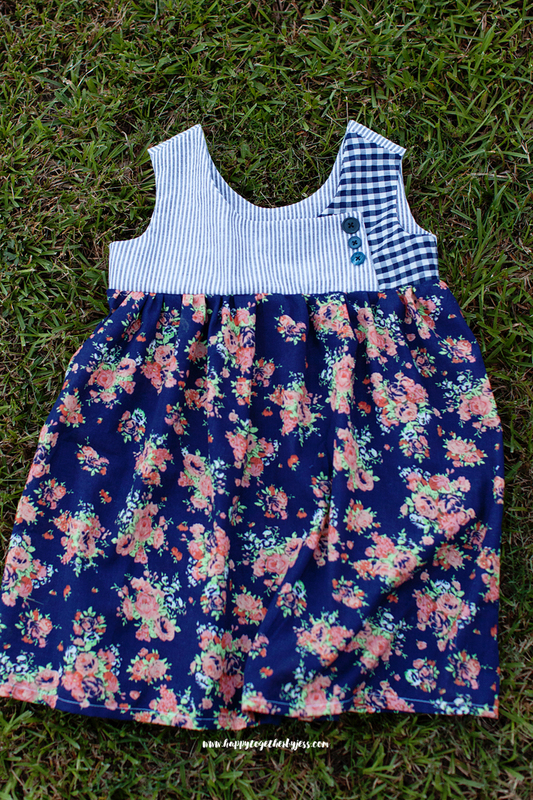 Particularly in multiple sizes so both granddaughters can get one; maybe with the same fabrics in different places. I have my mother’s (and of course mine since I caught her bug) button collection, and the fact that I don’t have to use the same buttons on the closure is great!!!! This is soooo cute! Thank you so much! I have two questions. 1. 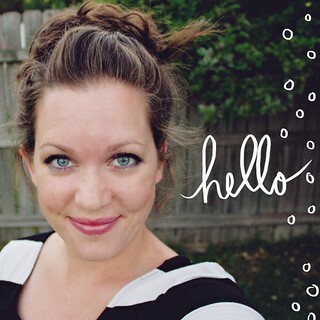 Where did you get your adorable labels? 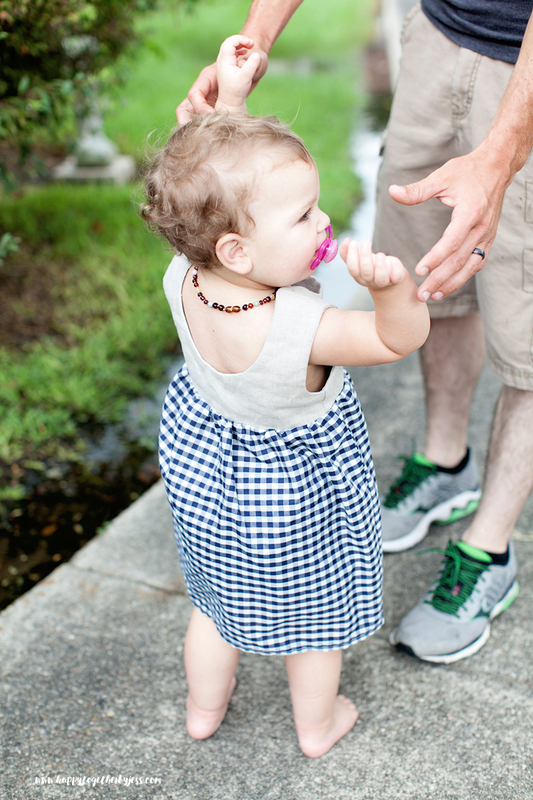 I’ve been looking for labels for a long time for when I make clothes for my daughter that have sizes in them, but with no luck on finding anything cute. 2. What is the name of that green and yellow flowered/foliage fabric? It is so pretty and my daughter loves anything green. Thank you 🙂 I actually made the labels myself for a quick fix (you can see about those here: http://www.happytogetherbyjess.com/fabric-label-diy/ ). 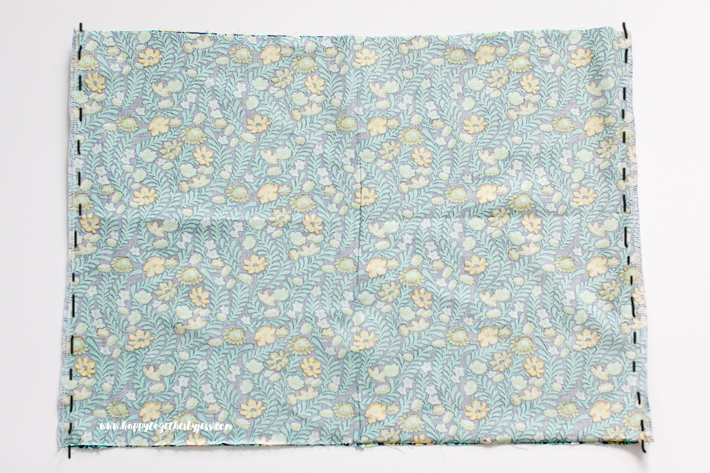 The fabric is from Tula Pink’s Eden in Wildflower Sapphire. 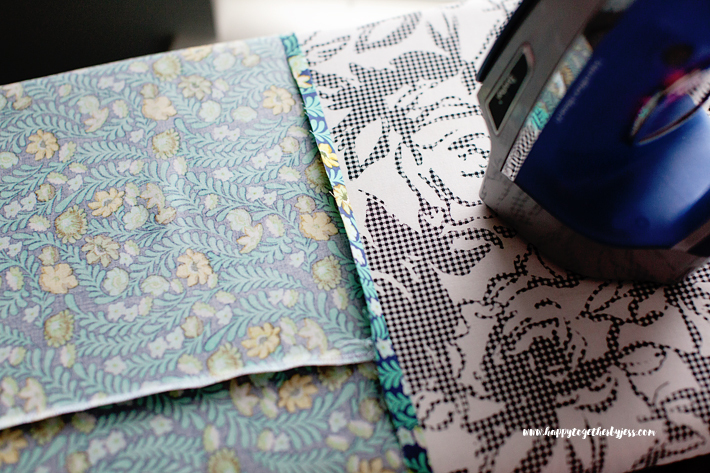 It is a very pretty fabric indeed. 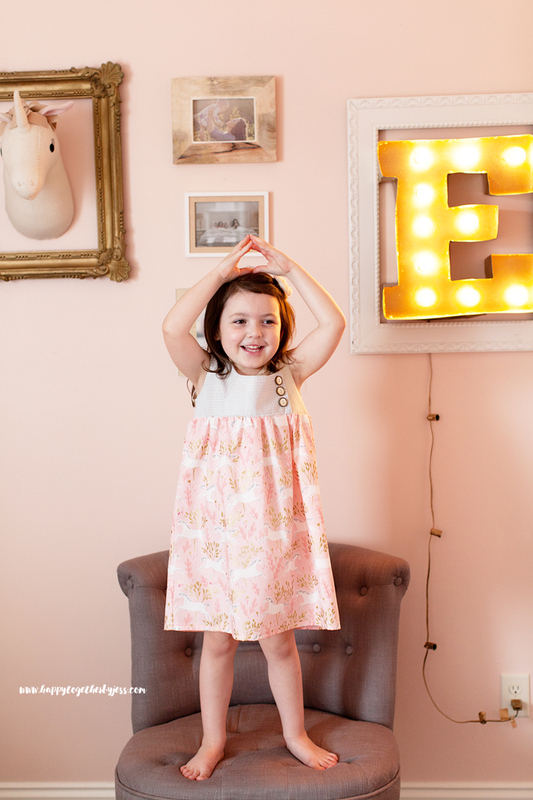 My 6 y/o granddaughter loves the pattern but really wants sleeves in it. Any suggestions are welcome. Thank you for the pattern. I just love the simple style. Its going to be great to use up some wovens I’ve been hoarding that my daughter is just about outgrowing. 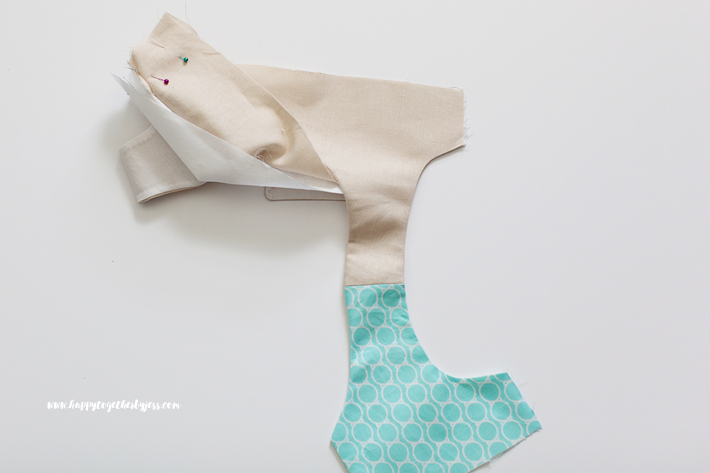 Do I have to add 1.4″ to the pattern for my seam or the pattern already icludes the seam allowance? 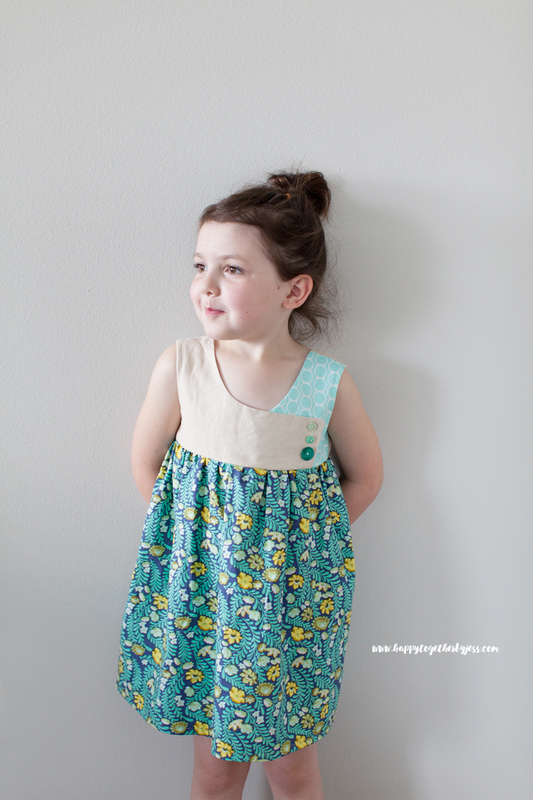 I’m still learning to sew and this dress is so adorable! Thank you so much! This is so darling! I love the unusual bodice detail. 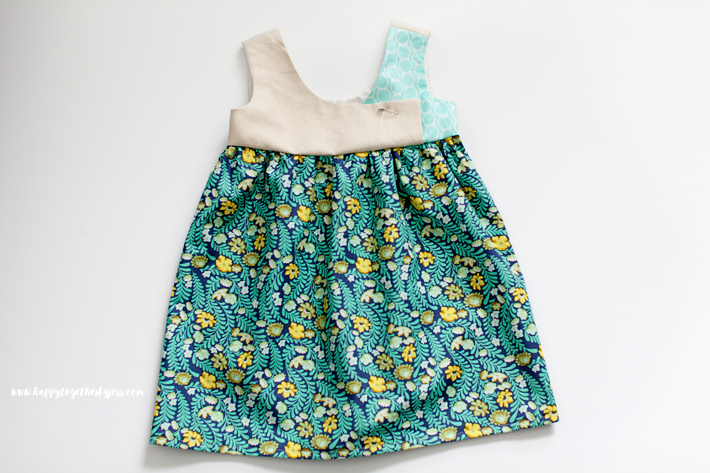 Thanks for going to the trouble of creating a FREE pattern to share. That’s really kind of you. Thank you very much for this really cute patten! 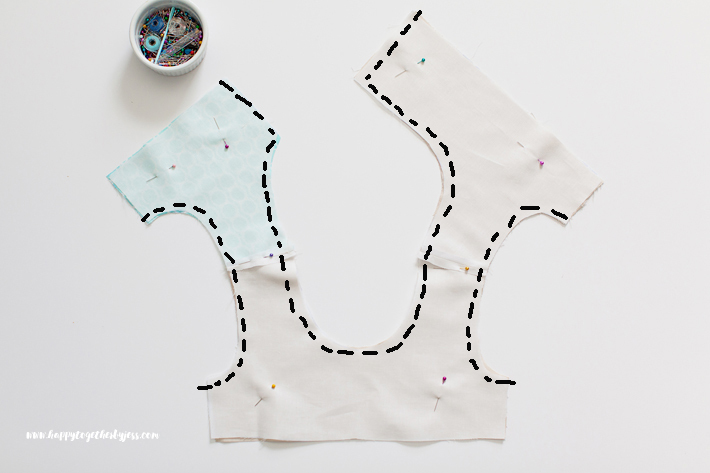 I’m usually a little bit skeptical towards freebooks, as I guess that there is a lot of work behind creating a sewing pattern, which should be honored. But I’m really happy with your august dress pattern (including your beautiful pictures and helpful instructions) and I would have paid for it for sure! Thanks a lot for sharing it! I can’t thank you enough for this pattern! I just made one using Halloween material and I added a ruffle on the bottom. I love it so much! I also added Kam snaps rather than the buttons to help with getting on and off. You are welcome 🙂 Great idea! Excellent tutorial! I made the dress for my niece. Being a beginner I was able to complete this with no issues. Thanks. His looks so cute and straightforward to make! What kind of fabric have Our used? It truly is 🙂 I have used many types of cotton fabrics (from apparel to quilting cottons) as well as fancier fabrics. You could use knits as well. Happy sewing! 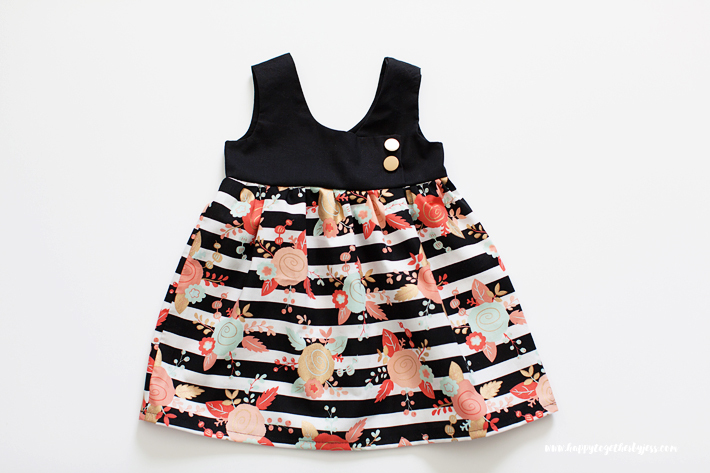 Thanks, I found it to be very cute on my daughter. 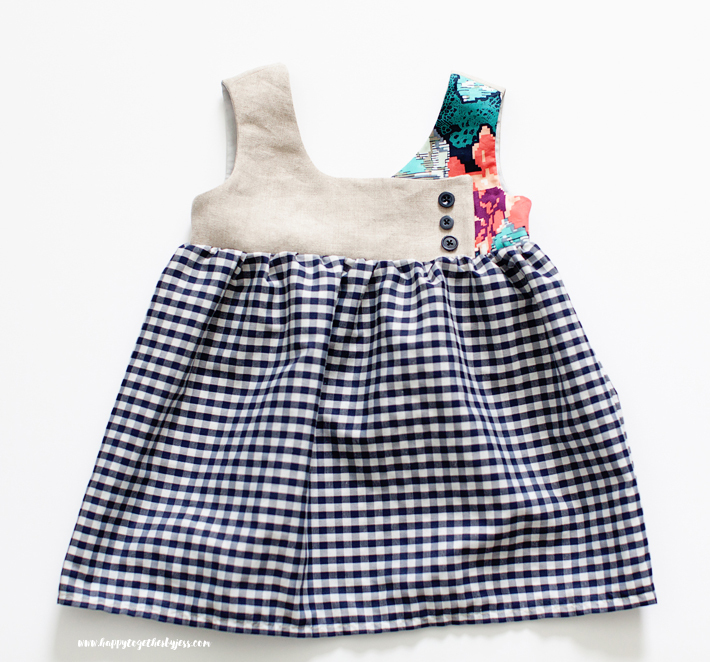 I think it is a good base for mixing different fabrics and using up odds and ends. You are very welcome 🙂 I’m so glad you were able to use it. You’ve done a beautiful job of this dress pattern,Jessica. 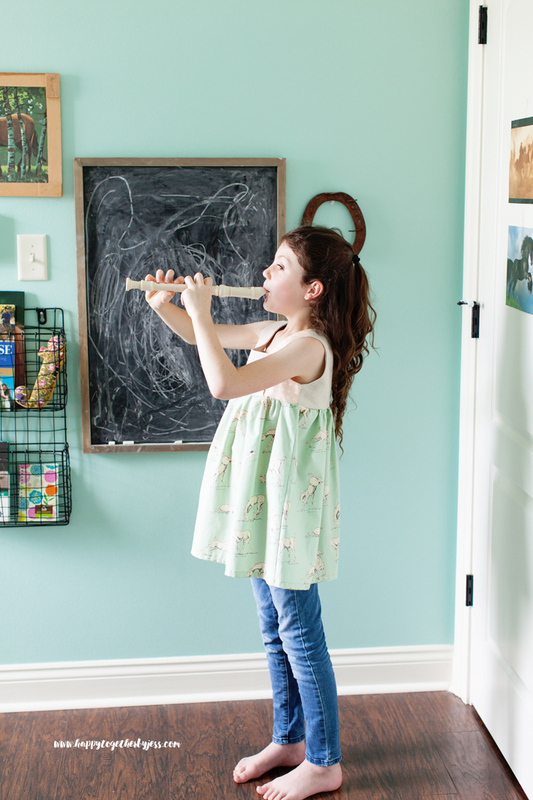 Your fabric choices are inspired! Although I ‘only’ have a baby grandson at the moment, I’m hoping for a grand daughter one day!! Well done !! Thank you so much! Your kind words make my day 🙂 I hope you get to bless a little girl with a dress made with this pattern one day! Love the pattern . So so cute. Used sized 2/3. Couldn’t get but one arm through the dress. Very disappointed. Made adjustments… Hope it works. Dress is darling. Cute dress pattern. A little problem in putting together the pages. One thought, though, a concern about the buttons. 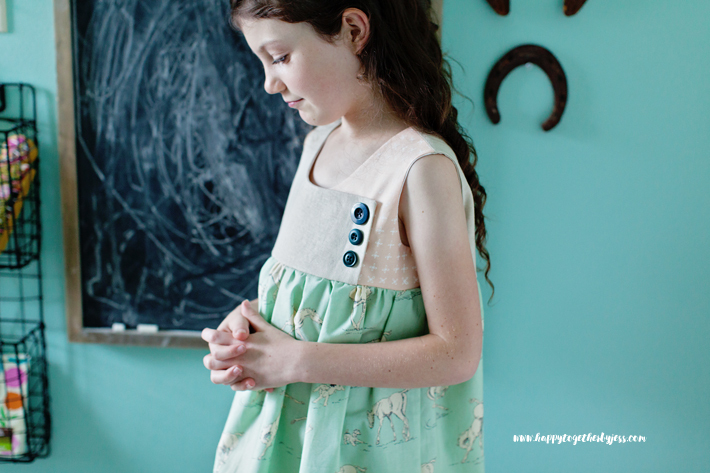 In sending these dresses to various countries, replacing the buttons might not be available. So will have to solve that somehow. 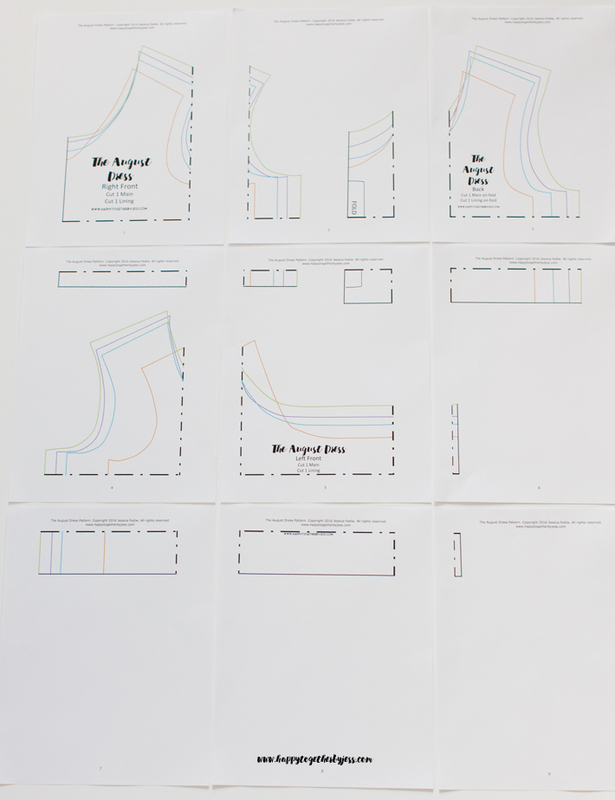 I printed the pattern….How do I enlarge the pattern so that it works in “real life?” This is the first time I’ve ever downloaded a pattern so I’m not sure where to go from here. Good news is it’s already the right size you need 🙂 If you line the pages up like shown in the picture, you will see how the different pages fit together. Then you cut them out and tape together so it will be the actual pieces you need. Thanks! I’ve cut it out. Will send a photo when it’s done.